I’ve said this before and I’ll say it again; one of the most powerful tools for building and sustaining customer relationships is email marketing. It’s cheap, easy-to-use, and is able to reach large quantities of people in no time at all. Although it is easy-to-use, it is still crucial that you follow the correct steps to ensure your emails will be delivered to your distribution list. To say it another way, you must keep spam filters top of mind whenever building out email campaigns for your brand. It is an absolute must. Luckily, it isn’t too difficult a task to build your emails to avoid spam filters. Let’s take a look. As previously mentioned, the list of criteria is much larger than this, however I would place a heavy amount of focus on the list I provided above when crafting your emails. Let’s take a look at the following tactics to avoid each of these criteria and, in turn, avoid spam filters. This first one is pretty straightforward. The best way to ensure you have been given permission to communicate is to avoid sending emails to purchased lists (I would suggest avoiding the purchasing of lists entirely) and rather, grow your database and email distribution lists ethically and organically. If an individual has opted into communications from your brand via a form on your website, they have given you permission to communicate with them. You’ll find this tactic to be immediately effective in ensuring deliverability. Keep in mind, it is important to communicate consistently with your contacts. If you are sending emails too frequently, recipients may be more inclined to unsubscribe or mark as spam. Alternatively, if you do not reach out enough, recipients may forget that they subscribed to your communications and forget about your brand. Find that sweet spot and be consistent. Be sure to provide an unsubscribe link within the email such that it is prominently visible to the recipient. It is much better to have someone unsubscribe rather than mark the email as spam. Also, please make sure to respect a subscriber’s decision to unsubscribe; that should be obvious enough, but I feel that I must say it. I encourage you to take your time with this tactic. Subject lines and body content should be well thought out when piecing together your email messaging. Intriguing subject lines are the gateway to getting your message across; poor subject lines drive your emails to the trash without even being read. Even if the subject line is so fantastic that 100% of people open your email, you need valuable body content to drive the action you are seeking. Tip: Use content personalization in your subject lines and body content to increase engagement. After crafting your email copy and subject line, I urge you to read through everything one more time and imagine yourself as a spam filter. Look especially closely for spam trigger words and phishing phrases; avoid them at all cost! Email Service Providers are evaluated as senders based on the reputation of the IP addresses and domains of their clients. Be sure to send emails from a reliable provider; fail to do so and your emails are destined for spam folders. Also, the “From Address” matters! I suggest sending them from a real human being’s email address within your company if possible, as doing so will give your emails a much better chance of making the recipients feel special and unique. Whatever you decide, be consistent to ensure the people on your distribution list won’t experience confusion when hearing from your brand via email. 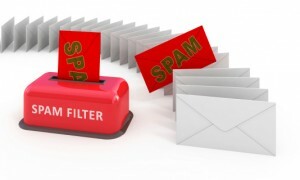 Spam filters are configured to block phishing attacks. Phishing is an e-mail fraud method in which the perpetrator sends out legitimate-looking email in an attempt to gather personal and financial information from recipients. A common phishing technique is to hide the phishing link behind a well-known link to get recipients to take the bait and click the link. To avoid the appearance of a phishing attack, I encourage you to link descriptive text as opposed to including a URL in your email body. To be honest, it looks more professional anyways. Bonus points! Nowadays, most spam filters have advanced enough to examine the HTML anyway, but it is still a good idea to include a text version of your email. It appeals to spam filters and subscribers using older email services, as well as those who have setup text-only reading settings. This tactic should be simple enough to execute considering most email service providers send text versions automatically. The use of images in a well-designed email can do wonders for engagement and allows more room for interaction. The use of header images, CTAs, and other images throughout your email can also increase click-through rates. Just be sure to have enough text to get your message across without depending solely on the images (not all email service providers populate images automatically). This article was written by Kevin Page from Business2Community and was legally licensed through the NewsCred publisher network. Previous articleSocial Media: Worth the Hype? You Betcha.